One day we may be so lucky to go into space and see the Earth in all its full glory. Until then, IMAX's "Hubble 3D," which opens today, will be a worthy substitute. Even the take-off scenes of the Space Shuttle Atlantis are stunning and literally stirring. The entire theater rocks as the in-your-face lift-off is filmed from an unmanned camera secured on the launch pad a short distance from the solid rocket boosters. The camera is literally engulfed in a cloud of steam made all the more awesome by the IMAX 3D experience. At this point you are clearly in for a ride. 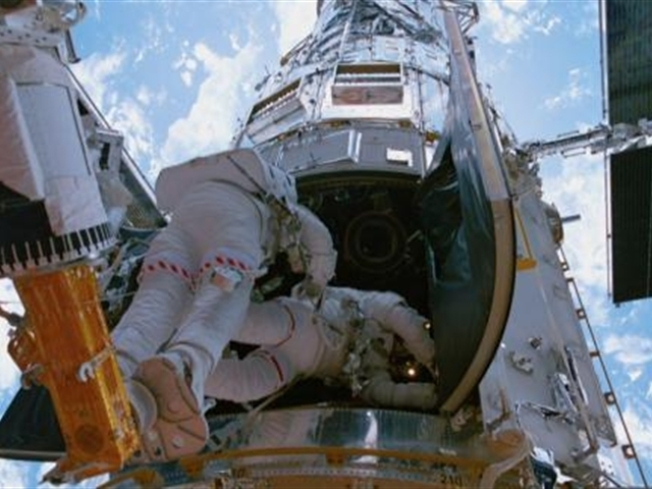 One valuable piece of massive cargo on board the Atlantis -- a camera which allows a glorious first-hand view of the mission to provide vital repairs to the Hubble telescope in space. The astronauts were trained to work the massive camera and other smaller high-def devices. The spacewalk repair scenes are great, but what really sticks in the mind is just the glory of the round blue Earth scene taken with these cameras and seen on this massive screen. This is not something you can hope to see at home. Ever. After the repairs, "Hubble 3D" focuses on some of the breathtaking views of the universe the telescope offers -- starting with the star clusters Orion Nebula and passing a shroud nursery of dynamically emerging stars. Each star is a potentially developing solar system. The view -- and the concept of these countless systems -- is both magnificent and humbling. Leonardo DiCaprio wouldn't be my first choice as narrator. Even his sense of wonder never moves too far off the clear script he's reading. But these are crumbs on a cosmic cake. As thrilling as it is interesting, this movie is a ride you won't forget.